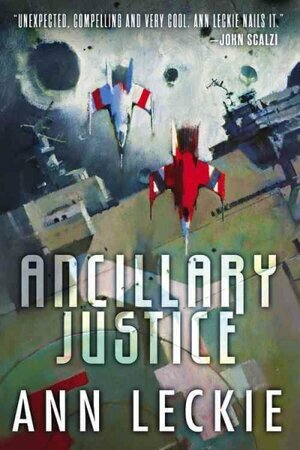 Ann Leckie’s debut novel ANCILLARY JUSTICE is an exceptional novel of military science fiction. It features Breq, who was once both the Justice of Toren — a starship — and One Esk, an ancillary soldier who was part and parcel of Justice of Toren. While both the starship and One Esk had consciousness and could think, neither was truly a person. However, Breq must now function as a person in her own right due to a traumatic event. Her ship gone, her placement gone, Breq must now learn to live as a solitary . . . and she doesn’t precisely like it. Note that I said “she.” Breq is really without gender in many ways; she comes from the Radch, an Empire that only uses one pronoun, she, for everything. Breq may be in a female body — the evidence strongly points that way, at any rate — but she doesn’t understand why gender should matter whatsoever. And when she deals with a world like chilly, isolated Nilt, where they still use gender-ridden pronouns, Breq is often beside herself with worry because she cannot guess right more often than half the time. Breq, as a person, is only a few years old. But her memories go back a thousand years or more. And it’s because of these memories that she rescues Seivarden Vendaai, a dissolute noble who served as a Lieutenant on the Justice of Toren a thousand years ago. Seivarden has become addicted to drugs and is completely alienated from contemporary Radch society precisely because he is out of his own time and place; that he’s on Nilt at this time, when Breq’s involved in tracking down one of her enemies, is only part of the story. Earlier in Breq’s life, when she was still both One Esk and the Justice of Toren, Breq served with Lieutenant Awn. Awn was a good person and an excellent Lieutenant who did his best, and One Esk idolized him, but without sentimentality. Or, at any rate, without overt sentimentality. Note that everything beyond this mark contains spoilers. You have been warned.
. . . read on at your own risk. When Awn dies, suddenly and violently, at the hands of someone who should’ve appreciated and admired Awn’s service, One Esk is beside herself. Yet it’s at this very same time that the Justice of Toren comes under attack, so One Esk has no time to process Awn’s death. The ship sends One Esk to do various things, and one part of One Esk ends up in a shuttlecraft. This one part of One Esk ends up becoming Breq, who takes a name because people have names; not to have one would make her stand out. Breq has an entire false profile, one that says she’s never been part of the Radch, which clues in the reader that the last thing Breq wants to do is call attention to herself. This is because ancillary soldiers becoming self-aware and attaining identities is supposed to be anathema. Even though Breq didn’t set out to be an individual, it doesn’t matter to the Radch. If they find her, they will kill her. And Breq knows this. Which is why rescuing Seivarden surprises Breq so much. But it shouldn’t surprise the reader, because it’s part of who Breq is. Breq is loyal, you see. She will not forget those who served her well, whether they saw One Esk as a person or not, whether they understood that the Justice of Toren was an AI or not. And whether Breq realizes it or not, she’s standing up for the rights of individuals to be remembered and respected whenever she does something to further her joint goals — those being, of course, to find out why the Justice of Toren was betrayed while doing her best to kill the person (or people) behind the death of Lieutenant Awn. There’s a lot going on in ANCILLARY JUSTICE, both at the macro and micro levels. But Breq, herself, is always comprehensible, whether she’s speaking as her newfound self, as One Esk, or even as the Justice of Toren. This is a considerable accomplishment, and it’s one for which Ms. Leckie should be applauded. There’s an argument to be made about the tripartite structure of Breq’s life/past lives as One Esk and the Justice of Toren as a study of posthumanism. It’s obvious that becoming more than human has aided the Radch; their ruler has many cloned bodies of disparate genders, while Breq/One Esk/Justice of Toren has served for over a thousand years, with distinction, without fully being either separate or human in most of our traditional senses. But I think there’s a stronger argument to be made by how Breq reacts, once she’s separate and must sort out how it feels to be a solo consciousness again, that human thoughts and feelings still matter — and matter very much — regardless of what time period you’re living in. Breq’s journey spanning over a thousand years is not an idle one; she learns, grows, and changes, but her essential personality and persona is unchanged until the death of Lieutenant Awn. It’s at this point that the Justice of Toren dies, that One Esk’s disparate parts are split, and Breq becomes herself. Life, supposedly, is what you make of it. If that’s the case, what Breq does with her life is not only extraordinary, it’s exceptional. Bottom line? ANCILLARY JUSTICE is phenomenal novel about life, death, postmodernism and its limits, and oh, so much more. It’s one of the best debut novels I’ve ever read in any genre, and it’s perhaps the best and most original novel of military science fiction I’ve read in the last twenty years. Take it as read that I’ll be standing in line waiting to read the sequel. (Figuratively, at any rate.) Write fast, Ms. Leckie! "Ancillary Justice", Ann Leckie, debut novel, exceptional reads, milSF, posthumanism, where's the sequel?